We all know sunglasses make any spy look cool, but these will let you see secret messages! 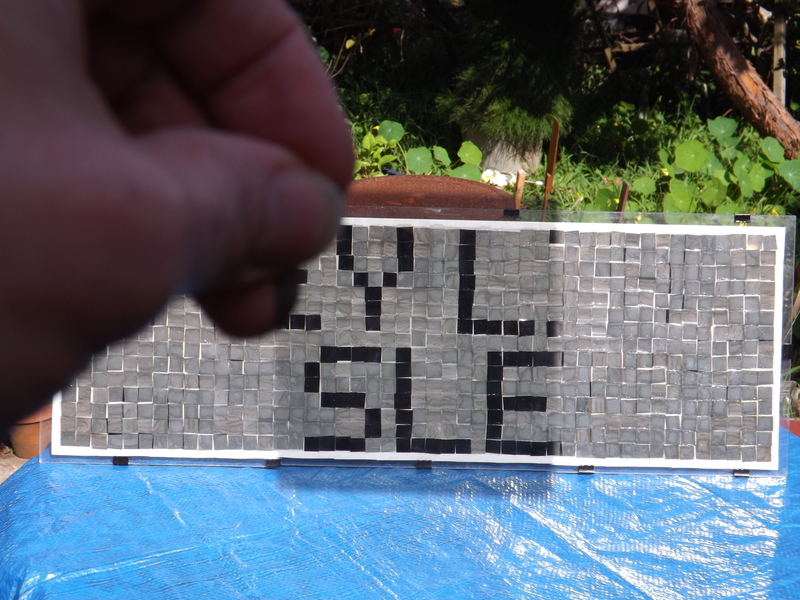 This secret message project uses polarized film (technically a linear absorptive polarizer) to make our message hidden. To see the message you either have to look through a second piece of film, or put on a pair of polarized sunglasses. Linear polarized film has tiny lines etched into it in one direction. These lines filter the light passing thru the film, polarizing it. 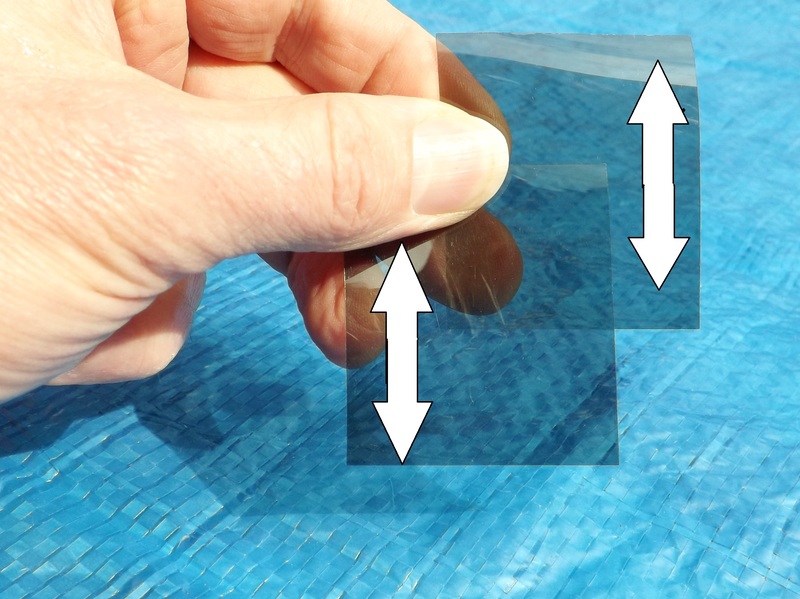 If you take two pieces of linear polarized film and arrange their polarization lines in the same direction, light will pass through both layers. If the two pieces of linear polarized film are “cross polarized”, they will block light. Polarized sunglasses use this effect to block glare. We can take advantage of this to build our project. 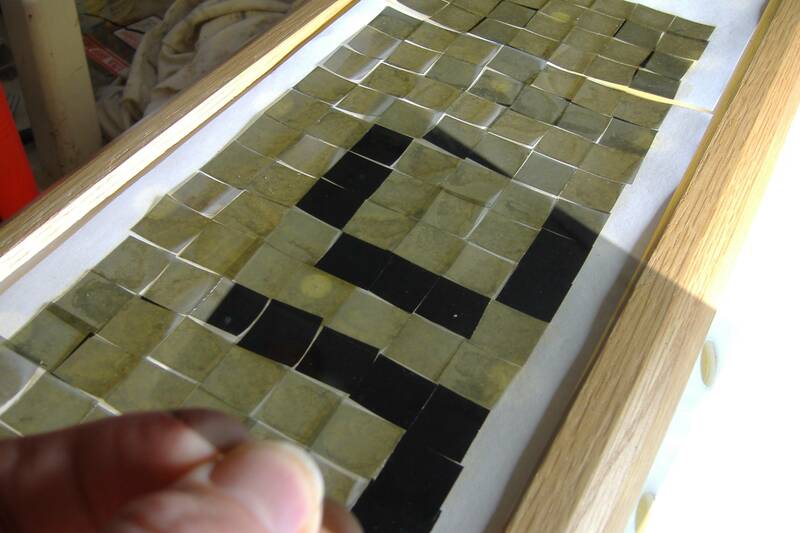 In our project we will make a mosaic of small squares of linear polarized film to spell out our secret message. The person that wants to see our hidden message needs to look through their own piece of linear polarized film or polarized sunglasses. Linear polarizer film You purchase this by the foot, and comes 17" wide. A backing to attach your squares of linear polarized film to, this can be poster-board, plywood, cardboard or anything that will hold up under typical spy use. A clear cover layer. This can be glass or plastic. If you select plastic, make sure it doesn't change the polarization of light passing though it. You can test this with two pieces of polarized film. Once you decide how large to make your message you can purchase your polarized film. You'll need as much film as the size of your message plus a little for viewers (in case your spies are not issued polarized sunglasses). Pick a secret message. Draw out the letters on graph paper using the 5x7 font. This will be your guide when you glue down your squares of film. I cut my linear polarized film to 3/4" squares on a guillotine paper cutter. This made letters that were 5" high by 3 3/4" wide. Draw out a grid to help you align your squares when you glue them down. I used 3/'4" squares, and drew a 1 1/2" grid to help me keep everything aligned properly. I wanted to light my hidden message from behind (back light), so I used Freezer Paper as my backing material. It is translucent and comes in long rolls. Put on your polarized sunglasses. This is where you get to look cool while building a project. Following the pattern you make on graph paper, glue down your squares of polarized film with rubber cement so that the letters are dark and the background is clear. Remember, turning the squares by 90 degrees makes they dark or clear. Anyone watching you can not see what you see. The polarized film squares glued to your backing are delicate and can be easily knocked off. You want to protect them with a covering of plastic or glass. I sandwiched my freezer paper backing between two layers of plastic and clamped them together with binder clips. 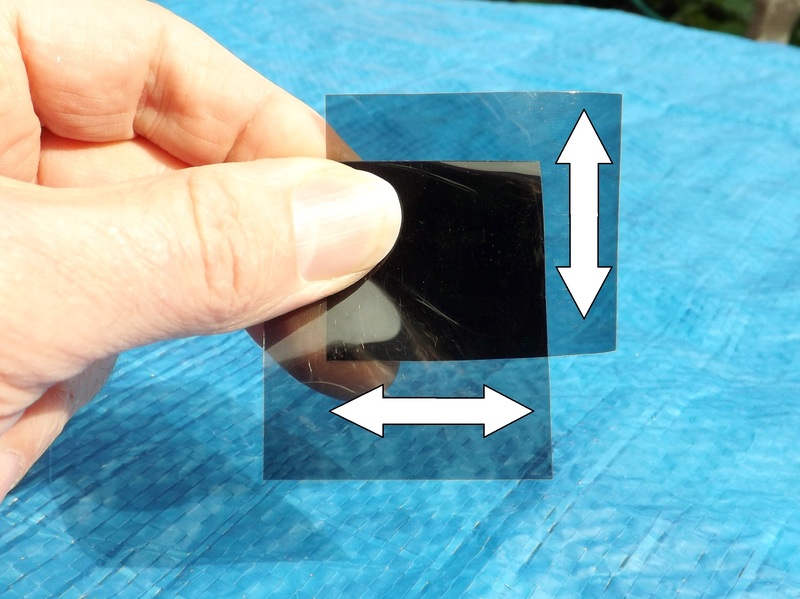 Put on your secret polarized sunglasses or look through a piece of polarized film to see your secret message. Robert Hermes enjoys creating things that make him laugh and employ some principals of science. He's an Engineer by day, but loves being a docent at the California Academy of Sciences, Nerd Nite SF videographer, a teaching member of TOOOL, and urban beekeeper. Robert's projects have appeared at Maker Faires in California and New York.